Broken glass and nails can be insidious, inflicting unseen damage to a car’s tires. So can accident debris, steel road plates, or hitting a curb too hard. All too often, the tire loses pressure gradually and the poor driver doesn’t have a clue until the car begins to handle differently, or he notices one of his tires is visibly flatter than it should be. Since tires are expensive to repair, it makes sense to patch and repair them if possible. Regarding the length of time, since tires require a specified amount of pressure to carry the load of the car, continuing to drive on a compromised tire can make it unsuitable for repair. As to the damage itself, industry guidelines allow repairs to punctures located in the tread area, as long as they are no more than 1/4 inch in diameter. Sidewall and shoulder repairs are forbidden, as are long cuts sliced through the tire’s steel belts. Relying solely on an external examination can result in returning a tire with hidden damage being superficially repaired and returned to service. This is why a tire must be removed from the rim before it can be determined if it is repairable. Many times, what seems to be a nail in the tread, can actually have resulted in damage to the inside of the sidewall that cannot be seen on the outside of the tire. How is Tire Repair Done? Once the technician has removed the tire from its rim, he will remove the foreign object, fill the void with rubber, and seal the inner liner with a repairing patch unit. However, and this cannot be emphasized enough, no matter how skillfully a patch and repair service is performed, if the tire itself is permanently weakened, returning it to service can result in disaster. This is why no service manager at Lang Nissan of Mission Bay will ever make a promise to a customer before a qualified technician has taken time to thoroughly evaluate the tire. Only then, will he or she inform the customer of the feasibility of it being safely repaired. and the certified Nissan technicians to impeccably service their vehicles, using genuine OEM Nissan parts whenever possible. Then there’s the comfort and convenience. Those with flexible schedules often choose to wait in the comfort of the waiting room with its well-stocked vending machine. 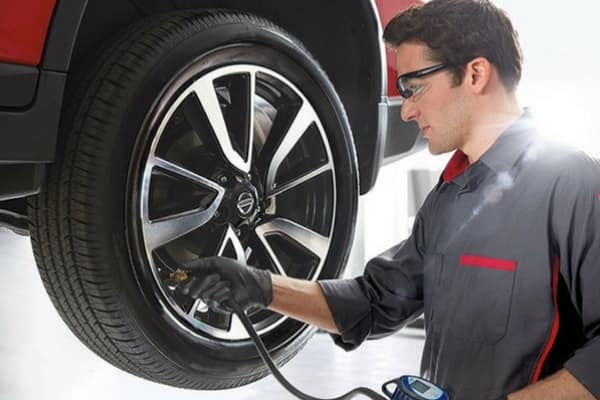 Along with tire repair, Lang Nissan at Mission Bay offers Exhaust System Service, Check Engine Light Diagnostic, Charging System service, and much more. Those who cannot spare time off from work, or whose vehicles will require extensive repairs, avail themselves of the convenience letting Lang arrange for a rental car.